Eddie Gets Ready for School | What is ML Reading? 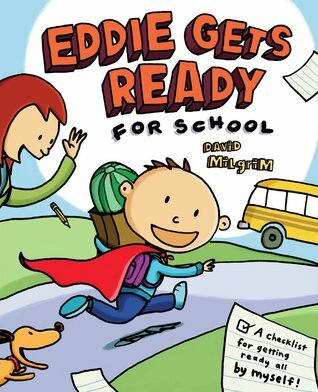 Eddie Gets Ready for School by David Milgrim is a fun read. My coworker introduced it to me after her three-year-old wanted to hear it over and over. Like Eddie, ML has a morning routine. She also has a bedtime routine. Unlike Eddie her morning routine does not involve wearing underwear on her head, drinking root beer, or packing a cat in her backpack. Neither does Eddie’s when his mom gets involved. I admit… ML does wear underwear on her head. Usually at night. She ties a large green blanket around a pair of underwear. Then places the underwear on her head. Prancing around with very long green hair. Calling herself Rapunzel. We love the checklist format in the book. When ML was first learning to do all the steps of her bedtime routine without me nagging, she wrote it on a note card. Then, checked each step off every night. Once ML finishes those two tasks, she can watch TV until it’s time to go. At the beginning of the school year we didn’t have this routine. Our mornings go smoother now. Not being allowed to watch Wild Kratts until she is dressed and eating breakfast is a real motivator. Usually, she brushes her teeth right before we scoot out the door. If we are running late, we skip that step. Don’t tell Dr. Schmorr. Tell the truth. Do your children always brush their teeth two times a day? This entry was posted in Picture Book and tagged David Milgrim, Eddie Gets Ready For School by mlreads. Bookmark the permalink.